It is a mounding grass with arching green branches with creamy yellow variegation. During the cooler temperatures of fall, it develops purplish red tones. It is a slow spreading plant. 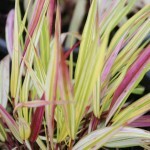 It prefers full to part shade, and well-drained soil. Use in groups in a shady garden, in containers, or cascading over rocks.